In the modern game, the coordination between the back defenders, holding midfielder/s and goalkeeper is critically important. The modern game requires the back defenders to condense the space in the midfield by forward movements coupled with use of the off side law. This condensing of space serves to reduce the opponent’s ability to build their attack through midfield. The challenge is as the space in the midfield is reduced, the space behind the defense is increased. It is imperative that the goalkeeper and defenders train and coordinate to cover the space behind. 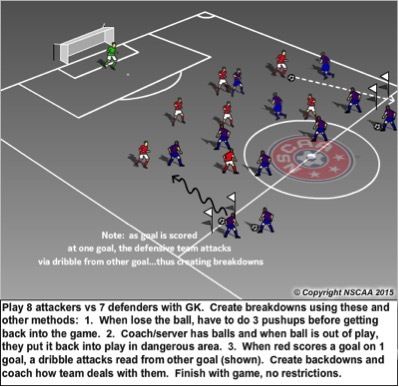 This training includes communication so that everyone is on the same page, exploring the physical capabilities of the keeper to cover space behind and, of course, the defenders and collective back defense reading the game. Specifically: read service; attacking runs, the quality of the runs and movements so that defenders eliminate attacking space behind their restraining line while the goalkeeper is trained to make good decisions and win some of that same space when necessary. 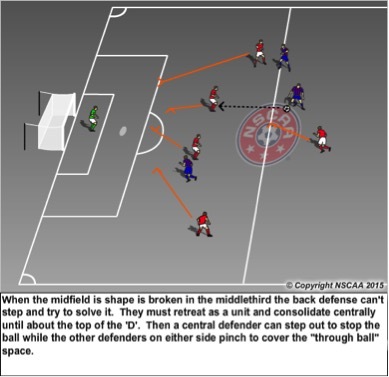 There are a number of different tactical approaches for the back defenders. They can hold a very strict line, using the off-side law, being conscious of attacking players and runs but responding only to the ball and responding only AFTER the ball is played. They can condense until the opponent has secured possession and initiated a probing attack and then drop into a sweeper system. My philosophy of training my goalkeeper, back defenders and even holding midfielder/s is a combination of 1 and 2 above. The first concepts I coach are the concepts of communication. I want my goalkeeper and defenders seeing, reading and communicating the same thing. Whenever a ball is played negatively by the opponent (more than just a few yards) or cleared or played forward by our team, I want the key communicators (usually GK and central defender and maybe more) commanding the team to STEP! STEP! If there is pressure on the ball when the opponent has the ball (midfield or attacking third), I want the key communicators, organizers to call out HOLD! HOLD! This means to stay in the condensed shape. 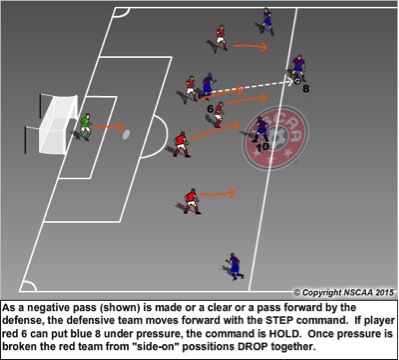 The defenders, especially central defenders need to be quarter turned or side on when the team is holding a high line so they are ready to side-on sprint back into the exposed space. If pressure is broken and the opponent can play forward, the command is DROP! DROP! The back defenders drop together and, the players are already positioned side-on so that sprinting to cover space is easier. If my defense is working properly there is a pulsating movement of condensing and expanding while the opponent has possession. 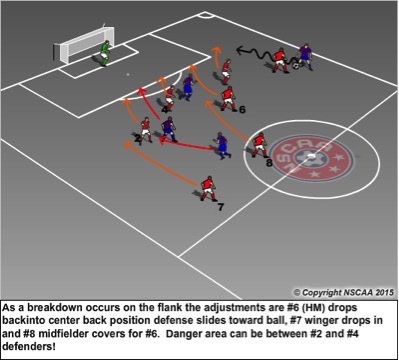 This forward, backward adjusting movement causes challenges for the attacking forwards to time their runs to get in from passes being played in behind. My teams don’t often just hold the line, especially if the opponent’s forward are fast. I want my GK and back defenders to adjust based on the movement of the ball, pressure on the ball and quality of opponent’s runs. I train this using a simple GK – Back Four – Holding Midfielder organization such as this and add players for the attacking team as needed. The defensive team can’t intercept of tackle but just move and communicate to condense, expand and eliminate dangerous attacking spaces in front and behind the defensive restraining line. Now, look at the next diagram. With no pressure on the blue #6. I still want the defense to STEP as the ball is passed back to that player, but, in my defensive scheme, they can’t just hold that position because without pressure the pass and run combination to attack the space behind the defense is too “on”. Therefore, the defensive red team must expand immediately after condensing to cover the space behind. 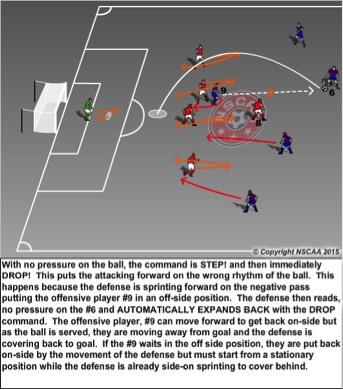 I call this “automatic expansion” and every defender and GK understands and executes. If the ball goes wide, then the rotation is as shown below with the outside back rotating towards the attacking player. This won’t happen every time as the outside back needs to make a tactical decision which is, can I put this player under pressure AS they are receiving the ball or should I hold my shape with the central defenders and allow the attack to progress and also allow a central teammate to slide out to defend the ball. Now, I train breakdowns from both central and wide positions. The first key breakdown is when the holding midfield gets beat somewhere in the middle third. You must train the coordinated response from the remaining defense, which is to drop together and consolidate centrally until reaching the top of the ‘D’; then a center back can step out to play the ball. By dropping together, the defense again eliminates space behind and also ties in the goalkeeper when a through ball is made. A critical mistake with my defenders is when the breakdown occurs somewhere around midfield for one of the center backs to try to win the ball back immediately. If they fail, the counter attack is on full speed and the chance of giving up a very good scoring opportunity is much higher. The defense must retreat together and by doing so delay the attack, allow for other to re-catch up but also bring the goalkeeper into the play. If there is a breakdown wide so that an outside back is beaten what is the defensive adjustments? 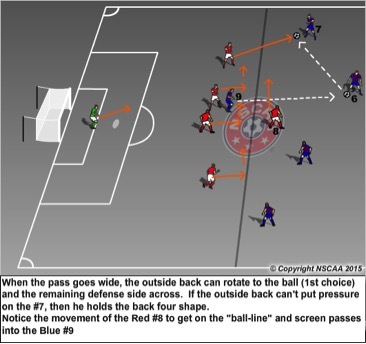 The first is for the holding midfielder (#6) to drop back into a center back position as the center back slides out to become the 1st defender (defender on the ball). Another adjustment can be the weak side winger now having to urgently get back to cover the back post area as the other defenders slide over. The best way to train these scenarios is to play offense vs defense but change the numbers…allow for breakdowns (player losing the ball, is out of the play for a 5 count) or any other restrictions that force defenders to communicate, and defensive rotations to fill gaps and solve breakdowns to take place. Tony DiCicco in addition to being the Director of Goalkeeping for the NSCAA is the former Head Coach – USA Women: ’96 Olympic Gold; ’99 World Cup Championship; ’08 U20 World Cup Championship. DiCicco also is the Founder and Technical Director of SoccerPlus Goalkeeper School and FieldPlayer Academy. For information go to www.soccerplus.org or call 1-800-533-7371.